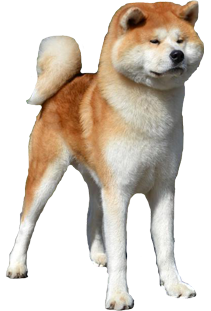 Chilie the hero Akita, an eight year old female Akita who saved the lives of two children and two adults in her family from a deadly fire in New York City, has won the American Kennel Club Award for Canine Excellence in the category of Exemplary Companion Dog. The families pet Chihuahua and cat died in the blazing inferno. 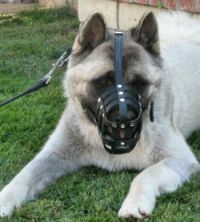 Chilie is an example of what the Akita breed of dog is capable of, loving and taking care of its family. 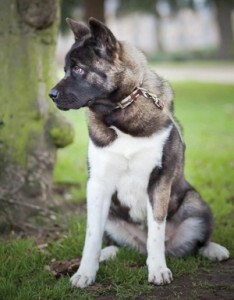 Have you seen or heard for akitas with long hair? They do exist and they are purebred, the long hair characteristic hasn't disappeared, according to some theories the gene comes from Karafuto Ken. We can see long haired dogs of both American and Japanese akitas , if both parents carry the gene then there is about 25% chance for long hair puppies. The annual Britain’s Next Dog Model competition – coordinated by grooming, training and healthcare experts, Mikki – has crowned its winner. 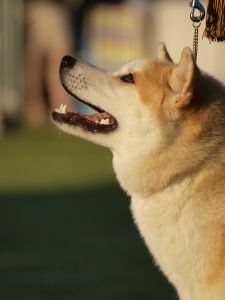 An Akita called Flora beat over 400 other entrants to secure her title. Flora will receive a photo-shoot with top UK dog photographer, Nick Ridley, a hamper full of Mikki goodies and will become the ‘face’ of Mikki for the next year.